"AS SEEN IN SOUTHERN LIVING MAGAZINE! 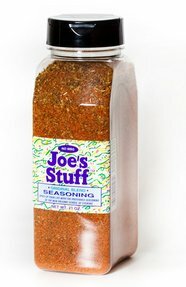 Blended especially for New Orleans Cooking, Joe's Stuff is a naturally low sodium, all-purpose seasoning blend that adds that perfect spice to all your dishes. You can use it as a spice rub or sprinkle in your favorite pastas, vegetables and soups. Get crafty and even add to popcorn, eggs, or salad. Mix with equal parts of sour cream and mayonnaise to make a delicious dip. It's not too hot or salty, it's just the right amount of spice. It also contains No MSG! For a spicier taste try Joe's Hot Stuff." Ingredients: Salt, herbs & spices, dehydrated garlic, paprika, dehydrated onion. Since 1980, the New Orleans School of Cooking has introduced countless visitors from around the world to the wonderful food and rich culture of Louisiana and New Orleans. Classes are held seven days a week in a beautifully renovated 1830's molasses warehouse. If you have any questions about this product by New Orleans Cooking, contact us by completing and submitting the form below. If you are looking for a specif part number, please include it with your message.